The Melodic Thrash / Prog Metallers of Burnaby, BC’s TRIBUNE are proud to reveal the album artwork and track listing from their upcoming 8 track annihilator “Elder Lore/ The Dark Arts” that will be officially released on Tuesday, March 20, 2012 under their independent label Corpse Corrosion Music. “Like a phoenix rising from the ashes, our album -“Elder Lore / The Dark Arts”– has come to usher in a new era of Canadian Melodic Thrash Metal, so come bask with us in this radiant, and dynamic vision. -“for none but death shall stop this lone revolution.” – lyrics from Bryan Baker of Tribune from the song “The Warrior Mentality”.” Commented TRIBUNE bassist Ryan O’Shea. This is TRIBUNE‘s third studio effort and second full length since the band of friends and brothers inception in 2005. Mixing elements of Death Thrash Metal with melodic vocals, the album will feature new material along with classic fan favourites and is an album capturing the raw energetic sound the band projects naturally live. 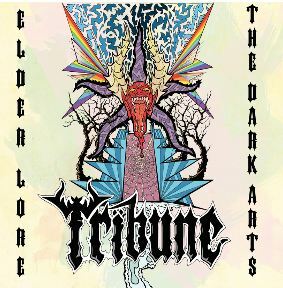 In additional news, TRIBUNE will also be kicking off their two month USA and Canada tour in support of “Elder Lore/ The Dark Arts” on April 2012 with dates soon to be announced. Original artwork by Ryan O’Shea. Genre defying. Accessible. Iconoclastic. This can only be Tribune. This entry was posted on February 15, 2012 at 9:48 pm and is filed under Heavy Metal, heavy metal albums, heavy metal news, metal music, Music, progressive metal, rock music, rock music news, Thrash Metal with tags canadian metal bands, death thrash, heavy metal albums 2012, heavy metal news, metal music, progressive metal, Thrash Metal, tribune. You can follow any responses to this entry through the RSS 2.0 feed. You can leave a response, or trackback from your own site.